The war is over and Britain is at peace. But in 1948 not only London’s architecture lies in tatters. When Juliette is committed to the asylum two memories haunt her: That of her baby being snatched from her arms and of fleeing on skis through an endless mountain range. Doctor Silver favours all forms of shock-therapy and it’s doubtful she can endure such barbaric treatments. A missing patient links Silver to a police enquiry while he seeks help from the Movement, an illegal cell he knew before the war. Certain this ideology is the model for a better world, he is easily led into illicit schemes. 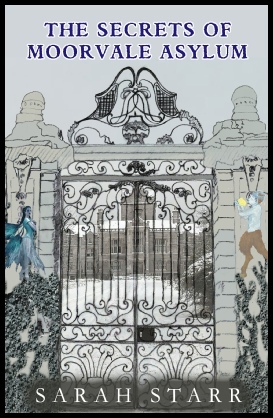 A troubled child discovers fairies have lived at the asylum long since its workhouse days. Their Natural Law seeks to restore peace and harmony but dark secrets are gradually unearthed inside the walls of Moorvale. Unseen dangers now lurk in the shadows and further threaten Juliette’s survival. Follow each twist and become spellbound as the story weaves to its magical conclusion. The Secrets of Moorvale Asylum in hardback, paperback or Ebook is available to order from any good bookshop, alternatively click on one of the buttons below to order on-line. Sarah Starr has 30 years experience of hospital related professions, along with 12 years spent in catering and hotel management. She is married with two step-children and lives in Sussex with her husband John. Two of her forefathers fled the European Pogroms to settle in London. Her grandfathers, father and extended family all served in the World Wars. The many people met throughout her career have also helped to inspire this story. Although entirely a work of fiction, this novel is based on real events.